One of my favorite activities in mathematics is exploring simple rules that can create complex systems. 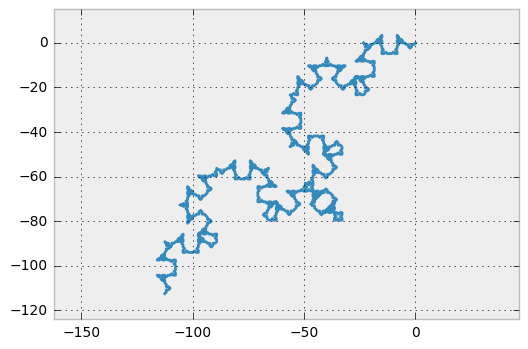 Fractals, such as those generated by Lindemayer systems (L-systems), are a great example of this. They are simple enough that they can be explained in ten minutes, but you could easily spend hours exploring what they are capable of. In this tutorial, I begin with line-drawing as a primitive and build up to a working L-system. 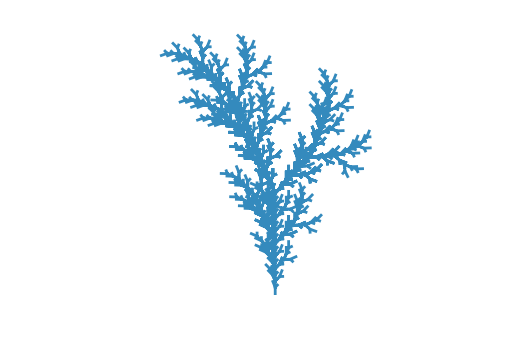 To draw fractals, first we need to be able to draw lines. 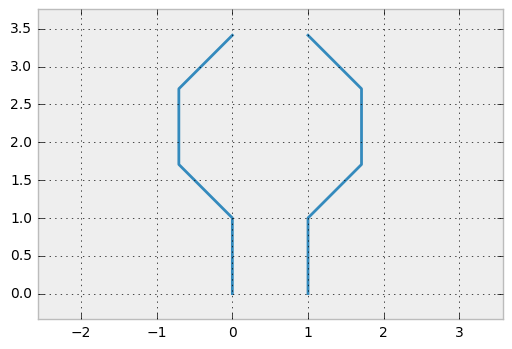 I'll use a library called matplotlib to do the drawing. If you are already familiar with matplotlib, you can skip to the next section. 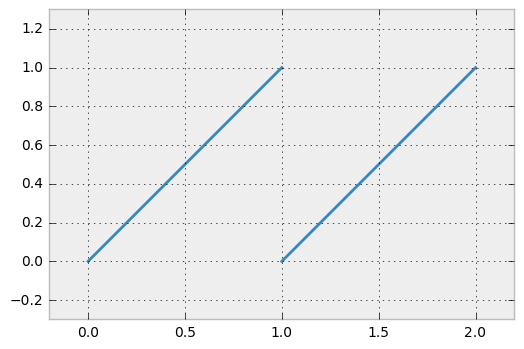 Now we can use matplotlib to draw lines by calling plt.plot. We need to pass it two lists: a list of values on the x-axis, and a list of values on the y-axis. 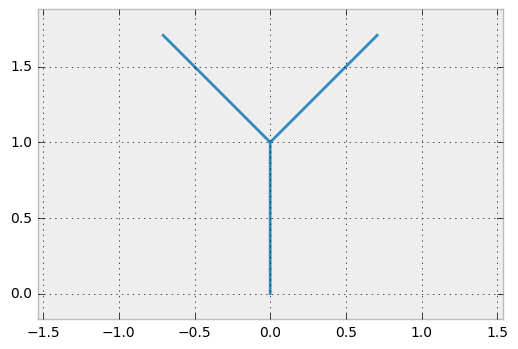 matplotlib steps through both of these lists at the same time to create coordinate pairs, and then draws a line through them. # The next two lines add labels to the axes. I find it easier to think about lists of coordinate pairs than it is to think about two lists of coordinates. 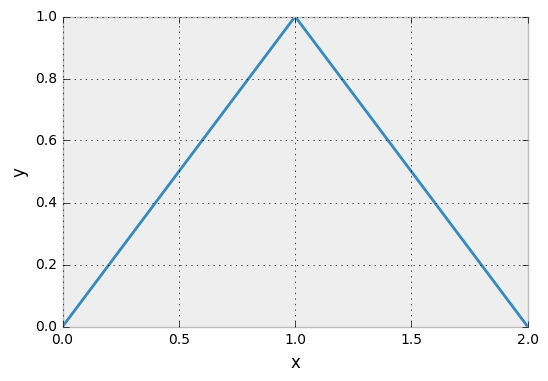 Below is a function below that takes a list of coordinates, converts them to the lists that matplotlib expects, and plots them. # Turns off the axis markers. # Ensures equal aspect ratio. # lists of X and Y values, respectively. If this is the first time you're encountering this approach to drawing, take a minute to figure out which corner of the shape corresponds to each point. Note that the origin (0, 0) is in the lower-left corner and coordinates count up (along the Y-axis) and to the right (along the X-axis). The coordinates are given as (x, y) pairs. So far we've drawn a shape by providing a list of points. Another method is to simulate a "turtle" that walks around the screen, tracing its route as it goes. This way, instead of calculating coordinates, we just provide instructions to the turtle. We need to keep track of two things while we move the turtle: its location in the x-y plane, and which direction it faces. This means tracking three numbers: the x and y locations of the turtle, and its angle in degrees. Updating the location when angles are involved uses some trigonometry, so let's load sin and cos. We'll also calculate a multiplier for converting angles in degrees to radians. The "instructions" that we provide the turtle are just a string of characters. The only valid instructions are 'F', 'f', '-', and '+'. Other characters are silently ignored. 'F' means move forward one unit and trace the path with a line. 'f' means move forward one unit but don't draw anything. '-' means rotate counter-clockwise but don't move. '+' means rotate clockwise but don't move. An example turtle program is "F++Ffff+F"
To interpret these programs, we will loop over each character. As we go, we generate a series of coordinates representing the lines. 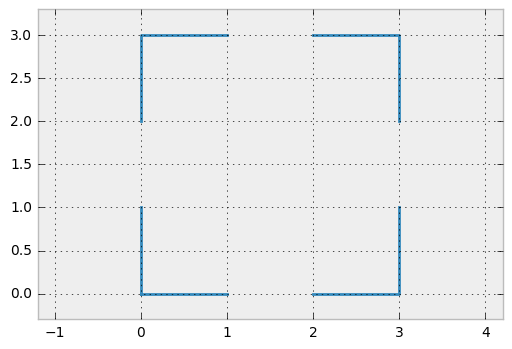 The resulting coordinates can be passed to the plot_coords function defined earlier to draw them on-screen. # The state variable tracks the current location and angle of the turtle. # The turtle starts at (0, 0) facing up (90 degrees). # pairs become the path that plot_coords draws. # Loop over the program, one character at a time. # this line segment isn't drawn. Instead of plotting the coordinates generated, we can also list them. This is especially useful when the results don't look like what you expect. Here's a simple function to print out a list of coordinates, indicating gaps in the path. Note that each "turn" instruction changed the angle by 45 degres. I made this the default, but turtle_to_coords can optionally take a second argument called turn_amount. This gives us a way to specify the amount to turn the turtle by on a rotation command ('-' or '+'). 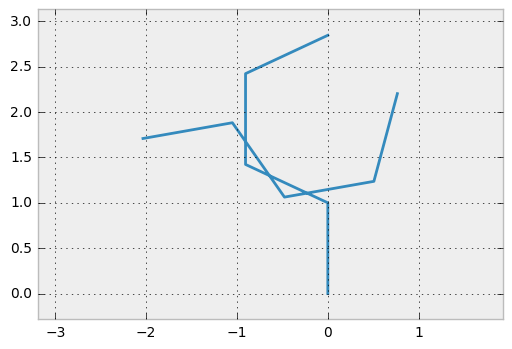 Observe how different values can result in very different looking plots, even for the same turtle program. 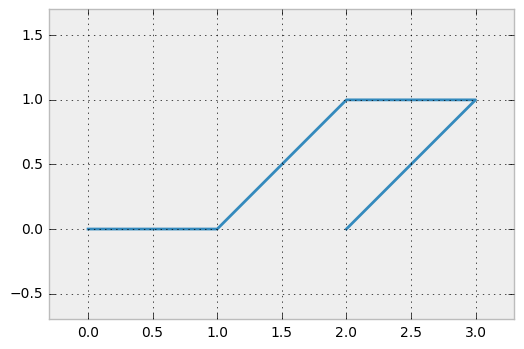 Compare the following to the above plot of the same program with a different angle. One of the cool things about turtle graphics is that it gives us a way to represent a path as a string. This means that we can operate on it using tools for manipulating strings, and then plot the results. One simple string transformation is to take an initial string (which we call the axiom) and one or more transformation rules. Each transformation rule specifies a character and a string. Each time the rule's character appears in the axiom, it is replaced with the rule's string. Characters in the axiom which do not have a rule are left alone. In Python, we can represent the transformation rules as a dictionary. Each transformation rule is represented as an entry with the character as key and replacement string as value. 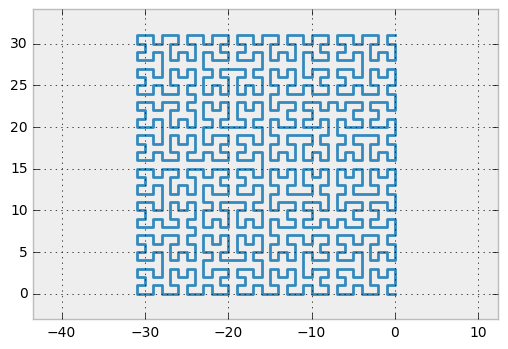 Here's one of the plots from the last section, this time written with string replacement. Transformations become more interesting when we apply them multiple times. We can take the output of the transformation, then feed it back into the transformation and run it again! There's one more piece to do before we can draw tree-like structures. So far we've drawn continuous paths. 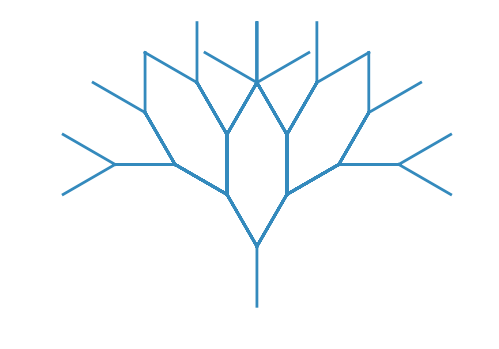 It turns out that it's hard to represent the sort of branching that a tree does with a continuous path. 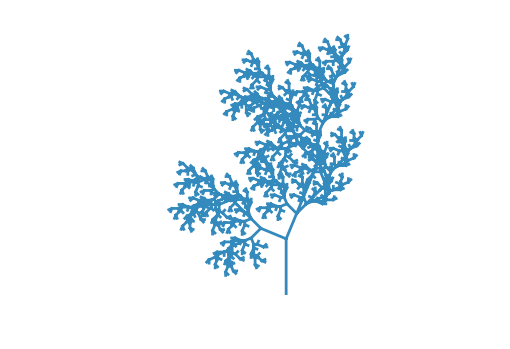 In order to represent tree-like branching, I'll add two new turtle commands: '[' and ']'. One way to think of these commands is that they give our simulated turtle a sense of memory. The '[' command tells the turtle to stay still but remember its current location (including the angle). The ']' command tells it to go to the last remembered location. Once the turtle goes back to a remembered location it promptly forgets about it, so then the next time ']' is called it goes to the last remembered location before that. A consequence of this "forgetting" is that the each ']' must match up with a prior '[', otherwise you are essentially asking the turtle to return to more positions than you told it to remember! Aside from the '[' and ']' commands, and the new saved_states variable, this looks a lot like turtle_to_coords. One other difference I should mention is that now any uppercase letter from A to J will move foward and draw a line, and any lowercase letter a to j will move forward without drawing. This opens up more possibilities when it comes to string rewriting. Recall that the turtle starts at (0, 0) facing up. The first F moves the turtle to (0, 1), still pointing up. Then the '[' command tells the turtle to remember its current position. The turtle then does a counter-clockwise rotation, goes forward, and resumes the remembered location. Then it rotates clockwise (remember, when it returned to its remembered position at (0, 1) it returned to the angle it remembered as well), and goes forward again. Iteratively apply the string rewriting transformations a given number of times. Convert the turtle program to a list of coordinates. It's almost starting to look like a tree! The symmetry is a bit sterile though, let's do something a bit asymmetric. I encourage you to use the code provided in this notebook to create L-systems of your own. If you're interested in learning more, I recommend the book The Algorithmic Beauty of Plants, as well as the other resources listed below.